These mechanisms produce a time delay in the closing of one of the leaves, letting the other pass, so as to achieve a controlled and effective closure of the two sheets, with the help of door closers. There are devices, not just the mechanics of the image, but also electro mechanics. 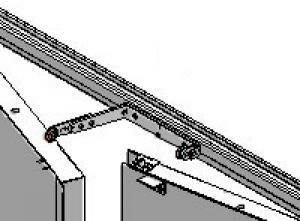 Moreover, the same door closers can do the role of selection and closing of closure, although the standard is the mechanical device of the image.